A charity has launched a fundraising drive to get a drug sniffer dog in Orkney. Orkney Drugs Dog wants a dog and handler to help police detect drugs and visit schools to educate young people about their use. It follows concerns from the Orkney Community Safety Partnership about drug abuse on the islands. Officers currently need a warrant to bring a drugs dog over from the mainland. 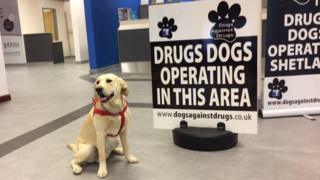 Andrew Drever, chair of Orkney Drugs Dog steering group, said a sniffer dog was needed in Orkney because "drug use has been getting more prevalent over the years". The dog and handler would check for drugs at Orkney's air and ferry ports and other places where needed. The specialist handler would be made a special constable with powers to arrest people suspected of drug offences. The charity says it would visit local schools and Orkney College to raise awareness about substance abuse among young people. It has already raised £35,000 from Orkney Alcohol and Drugs Partnership to cover setup costs and a further £3,000 in public donations. The annual costs would be about £50,000. A development officer position would also be created to secure ongoing funding. A similar scheme has funded sniffer dogs in Shetland since 2001. Mr Drever added: "The biggest aim is to educate and avoid folks taking drugs in the first place, but if that fails there's the deterrent of being detected and, with the assistance of Police Scotland, being put before the law. "It's acknowledged by Police Scotland that the ultimate responsibility is with them. "The difficulty is that the dog handlers in Inverness need to have a warrant before they come up so they don't do the education side, it would only be the enforcement side of it."